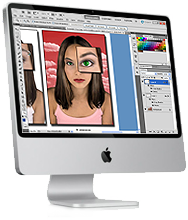 Photoshop CC | Bootcamp combines Photoshop | Level 1 & Photoshop | Level 2 classes. Become a Photoshop Pro in this 4 day Intensive Training Class! Learn how to retouch photos, manipulate & composite images, create graphics, color correct images, stylize text, learn shortcuts, tips, tricks, and more in this 4 Day Bootcamp Photoshop Training! Let's Get creative! Photoshop: Bootcamp is for beginners who need an thorough understanding of Adobe Photoshop. This is a beginner class that moves into intermediate/advanced skills and techniquesl. Recommended by Adobe for those planning to obtain the Adobe Certified Expert (ACE) status. What is the best format for my needs?